The FanDuel App gives New Jersey-based players the opportunity to place sports bets from their mobile device within the state. The app is available for both iOS and Android devices that meet the minimum system requirements. Read our full FanDuel Sportsbook review. The table below provides an overview and rating of what to expect from the FanDuel Mobile App. What features are on FanDuel Sportsbook? Visit the iTunes Store and search FanDuel Sportsbook. Locate the correct app and click on the Download button. The FanDuel App will automatically download and install on your mobile device. Open the app by clicking on the FanDuel icon. Visit the FanDuel Sportsbook on your mobile browser and click the Android icon in the mobile download section. You may then click on the Download Now button in your browser. Fanduel is currently offering a Welcome Bonus to all new players of the Sportsbook. It changes periodically, so it’s difficult to say what it is, however, it’s very common to have an enticing signup bonus for new customers. A pay-through requirement applies before players may withdraw funds acquired through the bonus. Create a FanDuel Sportsbook Account. Login and make a qualifying deposit. Place a qualifying bet. If the best loses your account will automatically be credited with a matching amount of your first bet up to a maximum of $500. Be sure to keep an eye out for any FanDuel Sportsbook promo codes when creating your account as it may be required to activate a bonus. Notifications: players can set up their FanDuel Mobile App to alert them whenever one of their bets completes or one of their favorite teams is playing. 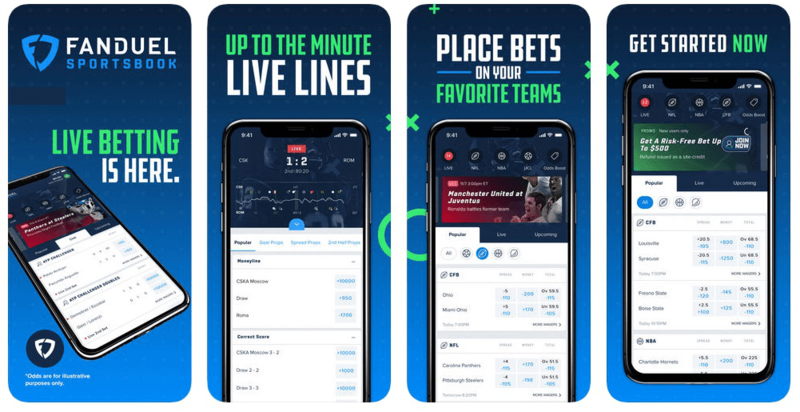 Live Betting: live in-play betting is available on the FanDuel App, providing players with the chance to bet on a variety of betting markets once select sporting events have already commenced. Quick Bets: betting on the app is as simple as tapping on the sporting event and typing in your wager. Cash Out: players may cash out of bets while they are progress for a loss or gain based on the current state of the sporting event. The following questions and answers can be used to help with any issues you may be having regarding the FanDuel Mobile App. Placing a bet is very simple on the FanDuel Mobile App. Simply click on the sporting event you would like to wager on and a betting slip will pop-up in your app. You may then type in the amount you would like to wager and click on the ‘Place Bet’ button to confirm the bet. To make a deposit, players must first create a FanDuel Account and log in to the app. Users may then visit the cashier section and use any of the payment methods available by simply clicking on them. After, players must type in the amount the would like to deposit and confirm the deposit. Much like making a deposit, players will be required to access the cashier section to make a withdrawal. In the cashier section, players may pick the withdrawal option and then pick a method of their choice. They must then pick and amount the would like to withdraw and confirm the withdrawal. Keep in mind certain withdrawing methods have minimum withdrawal amounts. Users can contact customer support via Live Chat, email, and phone on the FanDuel Mobile App. Live Chat is available 24/7 and is recommended as the fastest and most effective way to contact the customer service team. As you can see from above, the FanDuel Sportsbook app has many great qualities that make it a great pick for online sports bettors in New Jersey. With the addition of live streaming and a bit of fine tuning, the app can become one of the best sportsbook apps in the state. Be sure to activate the welcome bonus when you register for your FanDuel account. It gives new players the chance to receive up to $500 in a free bet if their first bet loses.